If a superhero were a company it might very well be in the form of Ravelin, which is an award-winning fraud detection and prevention platform for online merchants and the payment industry. This security company uses a combination of machine learning and human insight to intercept attacks before they happen. LondonTechWatch spoke with COO Nick Lally about Ravelin’s recent funding and how online fraud is a problem that needs serious attention. Ravelin has now raised a total of £12.3M over four rounds. Ravelin raised £8M in a Series B funding round. 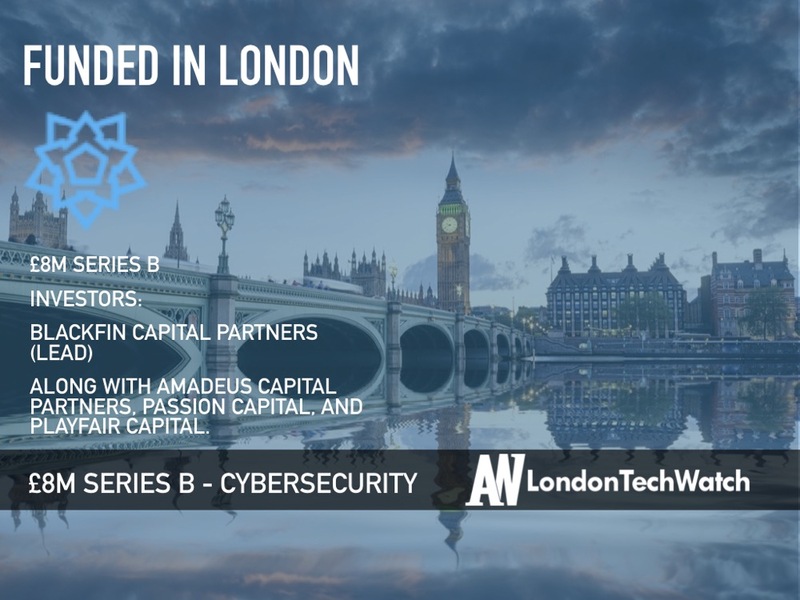 BlackFin Capital Partners led the round with Ravelin’s existing backers Amadeus Capital Partners, Passion Capital, Playfair Capital, and private investors retaining their stakes. Tell us about the product or service Ravelin offers. We are an award-winning fraud detection and prevention platform for online merchants and the payments industry. We use a combination of machine learning, graph networks, and human insights to detect fraud before the sale happens, saving merchants millions in chargebacks, lost customer revenue and reputational damage. Ravelin was founded in 2014 and is headquartered in London. What inspired you to start Ravelin? Based on our experience at a taxi app, we realised that the fraud solutions available had not kept pace with the speed of ecommerce. 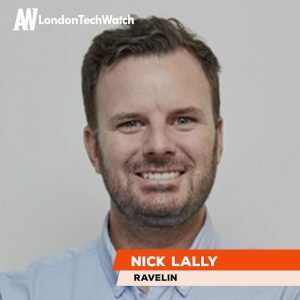 We founded Ravelin to tackle this problem by using the power of machine learning which at that time had become affordable for start-ups through innovation in cloud computing. Hailo and Deliveroo became early clients and the company has continued to innovate ever since. What are the biggest risks in the payment industry that are contributing to online fraud? The traditional approach to tackling payment fraud is to use rules or logic statements to query transactions and to direct suspicious transactions through to human review, but this is slow, expensive, and no longer suitable for this new evolving world of real-time purchasing. 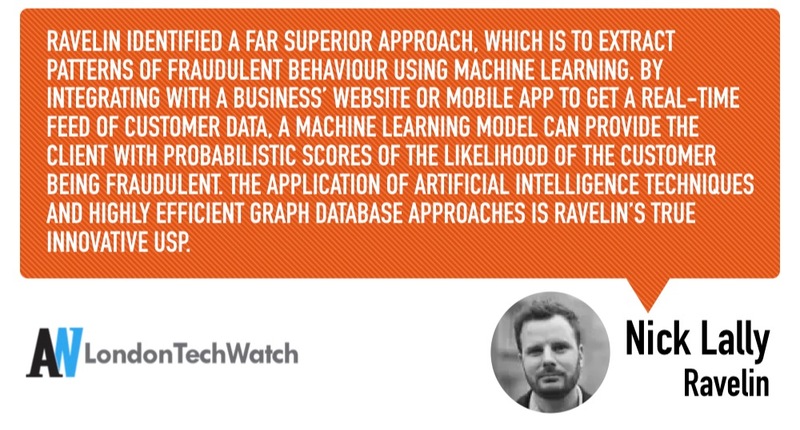 Ravelin identified a far superior approach, which is to extract patterns of fraudulent behaviour using machine learning. By integrating with a business’ website or mobile app to get a real-time feed of customer data, a machine learning model can provide the client with probabilistic scores of the likelihood of the customer being fraudulent. The application of artificial intelligence techniques and highly efficient graph database approaches is Ravelin’s true innovative USP. What market is Ravelin targeting and how big is it? We target businesses and merchants in a range of industries from PSPs to ticketing to e-commerce clients. We work directly with online merchants and their payment service providers to reduce losses to fraud and to improve acceptance rates of orders. 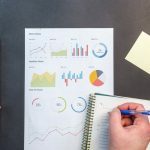 Ravelin’s choice of machine learning techniques to do this has proven to be both highly effective and extremely cost efficient for its clients. We offer an enterprise SaaS business solution for fraud detection and prevention using machine learning. As a startup founder you never stop fundraising. For the past 4 years I’ve been regularly talking to around 50 venture firms and updating them on our progress. This made the actual pitching process quite painless, as we only engaged with those firms who would be the best partners, and ones which understood our business and the market well. The hard work begins after getting a yes – negotiating term sheets, due diligence, wrangling the legal documents is the more challenging part. Trying to juggle the day to day operations, whilst also simultaneously raising a round. The time pressure to do both effectively is the most challenging. We have found market fit with solid growth, some big brand name customers who are happy with our solution, a proven tech platform, and a sales approach that is working. For investors to write cheques, it’s more about proving we have all the bases covered and removing risks. The funding underpins Ravelin’s expansion plans including a new office in the US. The company has also developed a product for Payment Service Providers. 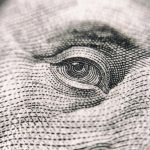 We will continue to invest in capabilities complementary to its core of chargeback protection, notably in account security and risk prediction. We’ve always been very measured in the way we spend money. The biggest cost to any startup is people, so the balance is to set a hiring plan, and not to get too far ahead of yourself. As sales come in, that is the time to hire. We plan to build out some additional product offerings, expand internationally, starting with the US, and grow our sales team. I enjoy wandering around the markets in London’s East End – Columbia Road Flower Market, and Broadway Market are two of my favourites.